In a few weeks, when Kevin Stitt goes to his polling place to vote for only like the third or fourth time in his life, he’ll probably notice some relatively unknown candidates on the ballot with I’s by their names. These individuals are called “Independents,” and since they’re not a member of one of our country’s two big money, big influence political parties, the kingmakers in the partisan, for-profit media rarely give them any merit or attention. Well, that is unless the candidate is wealthy or a celebrity. If that’s the case, the media will come running with tails wagging. That being said, sometimes the media will be nice and throw these fringe Independent candidates a bone, and give them some attention and publicity. 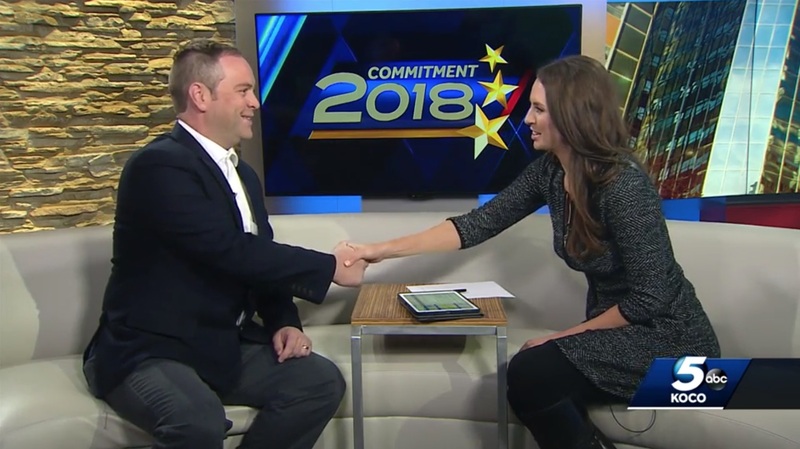 That’s what happened yesterday when KOCO’s Markie Martin invited Christopher Hensley to the KOCO morning show to discuss his candidacy for State Senate District 40. From Hensley’s nervous energy and awkward silences, to his dozen or so near emotional breakdowns while talking about the Oklahoma people and his own personal tragedies, it was the most entertaining six-minutes of local political theatre I’ve watched in at least a month. Dammit. KOCO doesn’t have an embed feature for their videos, so I just used a random photo from Markie’s Instagram page. Anyway, I guess that means you’ll have to go to the KOCO website to watch it. When you do, make sure you have tissues. You’ll either be crying due to laughter, sadness or both. Also, if you live in State Senate District 40, please consider giving Christopher a vote. Although he’s not a member of one of the two political parties that are doing their best to ruin our country and gain control, at least he really, really cares about the Oklahoma people, and just wants to give them a voice. She’s a news reader, not a reporter. He seems like a decent human being. I wish him luck. My goodness, good for you Mr. Hensley for having the guts to run and put yourself out there as a choice. I do not live in your district, but Sir, the nature of your grass roots effort needs to be commended. Poor guy was so nervous I thought he was being nominated to be an unwilling organ donor going under the knife without anesthesia. He appears to give a damn. These days that’s all you can ask. Markie Martin is a newsreader a cross between an Ogle and a NPC meme, Mr Hensley is a intellectual giant compared with flock of OKC newsreaders. Only by comparing our local newsreaders to the Anderson Coopers and Rachael Maddows of national NPC fame our locals don’t seem so bad. You know how I know your comments are worthless? You used “NPC” twice in the same post. Maybe you should leave the basement. Mom says your tendies are ready. It’s funny when people joke about others just repeating stances they’ve heard, while endlessly repeating the same meme’s they’ve seen online. Not that I even remotely agree with Maddow or Cooper, but intellectually challenged they’re not. Maddow has a degree from Stanford, was a Rhodes Scholar and holds a DPhil. Cooper has a degree BA in PoliSci from Yale. Don’t like ’em, but gotta give ’em props. this guy is more genuine than the entire lot. Deserves the votes. KOCO’s General Manager is named Brent Hensley. He occasionally does editorial commentaries that run on KOCO’s news segment. I’m wondering if, by chance, he’s related to candidate Christopher Hensley. If so, then that just might explain why KOCO “threw him a bone,” as you put it. Bravo, candidate Hensley. Thanks for getting out there!